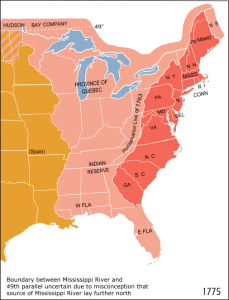 This map shows colonial America as it existed in 1775, just prior to the American Revolution. The Proclamation Line divides the eastern half of the map, allowing European settlement only in the areas that appear red. Even before the Revolution, settlers ignored the Proclamation Line and moved westward into the Ohio River Valley, undermining British rule and exposing the inability of the Crown to control its expansive empire. 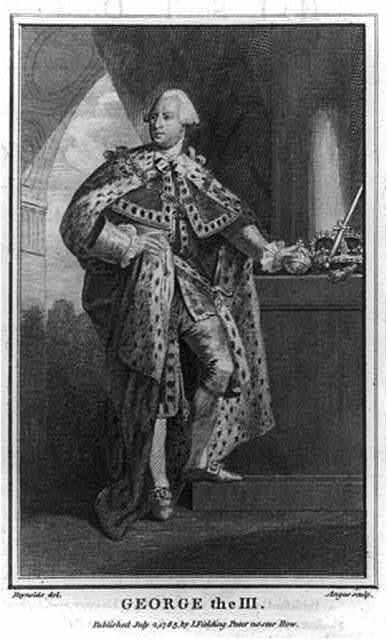 King George III of Britain issued the Royal Proclamation on October 7, 1763, prohibiting European settlement of lands west of the crest of the Appalachian Mountains. In Pennsylvania, the line fell about two hundred miles west of Philadelphia. While the proclamation was intended to establish British rule over land newly won in the Seven Years' War, Native Americans rejected the monarchy's claim to rule them. European colonists also ignored the Proclamation Line, an act which highlighted the Crown's inability to control its massive empire of colonies. 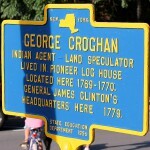 George Croghan Marker, Cooperstown, N.Y.
Irish-born fur trader and land speculator George Croghan (c. 1718-82) was one of many European settlers who were frustrated by the Proclamation Line. 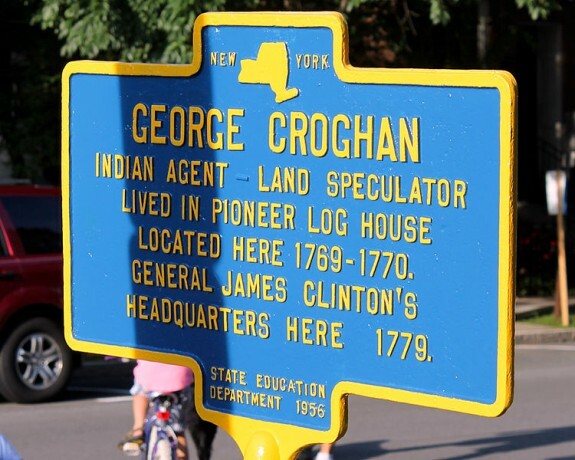 Croghan served as an intermediary with the Native Americans in the French and Indian War. After that conflict and Pontiac's Rebellion, Croghan became convinced that the settlers’ economic losses entitled them to lands west of the Appalachians. In 1764, Croghan traveled to London to implore the Crown to move the Proclamation Line west to the Ohio River. Croghan continued to serve as an intermediary with the Iroquois until he was barred from this activity by George Washington. In addition to Pennsylvania, he lived in Cooperstown, New York, where this plaque marks the site of his homestead. 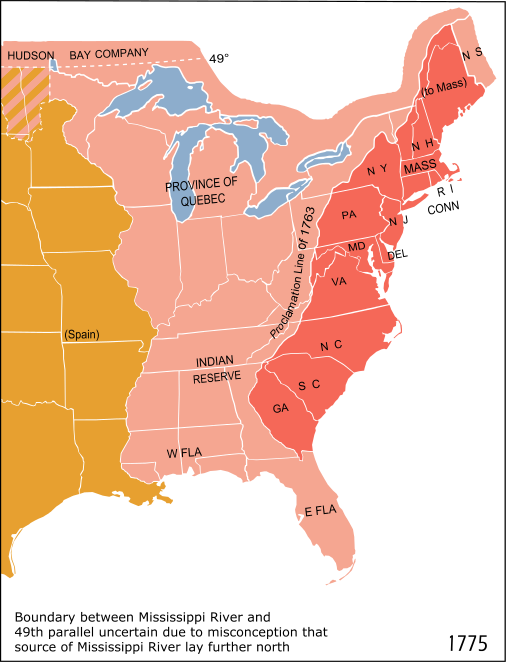 The Royal Proclamation of 1763 created an imaginary line along the Appalachian Mountains that prohibited European settlement beyond the crest of the mountains, approximately two hundred miles west of Philadelphia. It thus established the region from the eastern seaboard to the mountains as the extent of British North America. In Pennsylvania the proclamation heightened racial, economic, and political tensions in the 1760s and early 1770s, thus contributing to the colonists’ discontent with ineffective British policies. Moreover, between its promulgation on October 7, 1763, and the start of the Revolutionary War, colonists and Native Americans disregarded the Proclamation Line, thus exposing the limitations of British imperial control. When Britain obtained lands west of the Appalachians from France as a result of the Treaty of Paris (1763), which ended the Seven Years’ War (1754-63), British officials needed to reestablish imperial authority over existing British subjects and bring the peoples who resided within these lands—both French and Indian—under imperial control. 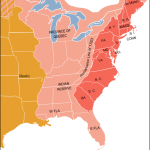 Administrators in England thus devised the Proclamation Line, which essentially cut off eastern Pennsylvania from the western part of the colony and reinforced politically the Appalachian Mountains as a natural barrier to colonial expansion into the Ohio River Valley. 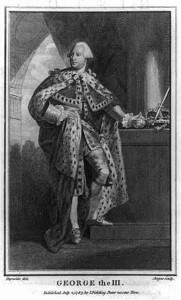 King George III (1738-1820) issued the proclamation, written by members of the British Board of Trade, that aimed to dictate the pace and locations of colonial expansion, endorsed the separation of natives and colonists, and sought to reap economic benefits from the territories east of the Mississippi River. In Pennsylvania, the proclamation indirectly intensified racial hatred and cultural conflicts when Native Americans rejected British pretensions to rule in the trans-Appalachian west. In a series of spiritually charged battles known as Pontiac’s War (beginning in 1763 after the Treaty of Paris), Native Americans attacked British forts in the region from what later became Michigan through western Pennsylvania. Delaware and Shawnee Indians raided colonial settlements between the Proclamation Line and Susquehanna River Valley. In response, frontier colonists, blaming the provincial government for lack of military assistance, indiscriminately attacked local Indians. The so-called Paxton Boys murdered peaceful groups of Conestogas at Conestoga Manor and Lancaster in December 1763 then marched on Philadelphia in the attempt to attack Christian Moravian Indians who came under the provincial government’s protection. These events set aggrieved Scots-Irish and German frontiersmen against the government and pacifist Quakers, challenging their political power in Pennsylvania. The imaginary line also frustrated Pennsylvania land speculators. 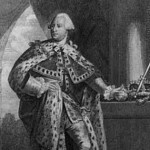 In the mid-1760s, traders such as George Croghan (c. 1718-82) insisted that economic losses sustained during the Seven Years’ War and Pontiac’s War entitled them to western lands. In the early 1770s, Benjamin Franklin (1706-90) and associates sent a petition to the Board of Trade that provided rationalization for opening of lands beyond the Appalachian Mountains for Pennsylvanian settlement through the erection of new colonies. Speculators argued that colonists from Virginia, Maryland, and Pennsylvania had already ignored the boundary line and that the lack of political, social, and economic connections between Pennsylvania and its frontier limited the commercial value of the Indian trade and the extension of British authority. For Revolutionary Americans, the Proclamation of 1763 was a highly contentious document that pitted colonists against Indians, frontiersmen against the Pennsylvania government, and merchants, traders, and speculators against the imperial government. While the proclamation was meant to increase imperial authority over the colonies, it actually increased colonial discontent with British policies and demonstrated to both colonists and Native Americans the lack of imperial control over eastern North America. Austin Stewart is working on his Ph.D. in American history at Lehigh University in Bethlehem, Pennsylvania. Anderson, Fred. Crucible of War: The Seven Years’ War and the Fate of Empire in British North America, 1754-1766. New York: Knopf, 2000. Dowd, Gregory Evans. A Spirited Resistance: The North American Indian Struggle for Unity, 1745-1815. Baltimore: The Johns Hopkins University Press, 1992. Dowd, Gregory Evans. War under Heaven: Pontiac, The Indian Nations and the British Empire. Baltimore: The Johns Hopkins University Press, 2002. Merrell, James H. Into the American Woods: Negotiators on the Pennsylvania Frontier. New York: W.W. Norton, 1999. Merritt, Jane T. At the Crossroads: Indians and Empires on a Mid-Atlantic Frontier, 1700-1763. Chapel Hill: The University of North Carolina Press, 2003. Ward, Matthew C. Breaking the Backcountry: The Seven Years’ War in Virginia and Pennsylvania, 1754-1765. Pittsburgh: University of Pittsburgh Press, 2003. Almon, J. Report of the Lords Commissioners for Trade and Plantations on the Petition of the Honourable Thomas Walpole, Benjamin Franklin, John Sargent, and Samuel Wharton, Esquires, and their Associates. London: 1772. Cadwalader Family Papers and George Croghan Papers, Historical Society of Pennsylvania, 1300 Locust Street, Philadelphia. Its a wonderful website to use for a class projects that i’m doing for school.